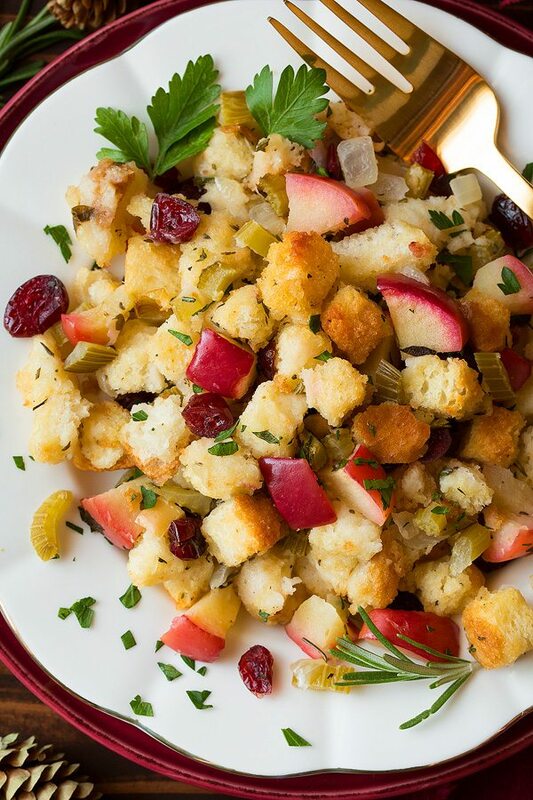 This Apple Cranberry Rosemary Stuffing is one of the best recipes (this one and the Slow Cooker Stuffing I shared last year are a tie for top favs)! As a kid I always hated the stuffing at the Thanksgiving table, but oh how things have changed! I could sit down and eat a big bowl of it for a meal – that is if it’s homemade like this one. 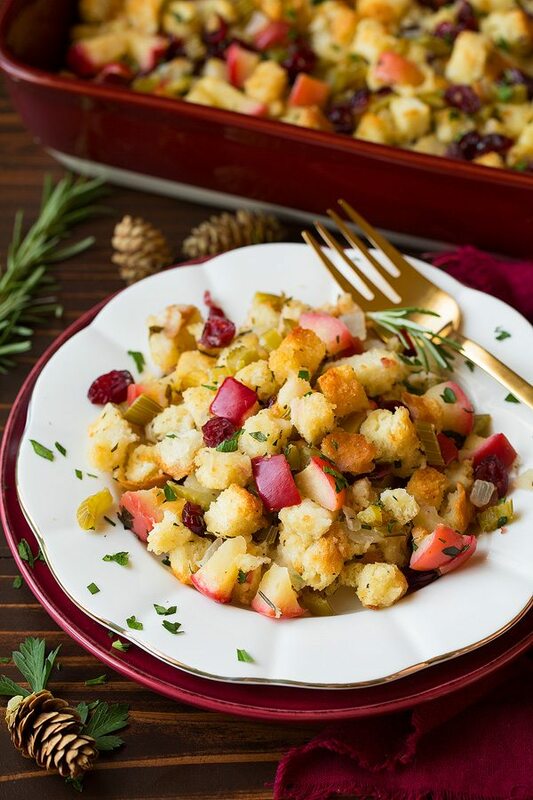 I love this twist on stuffing with the apples and cranberries in it. 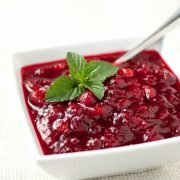 It gives it a nice light sweetness and since it has cranberries you could even skip the cranberry sauce this year. And they both pair with the fresh rosemary perfectly. Of course I also love how buttery and perfectly delicious this is! Trust me you’ll want to make it again and again, and not just for Thanksgiving. For a weeknight dinner I just served it as a side to rotisserie chicken and a veggie (or more like a main dish to rotisserie chicken because we ate so much of it!). Dry bread cubes in oven. Saute veggies, then add apples. 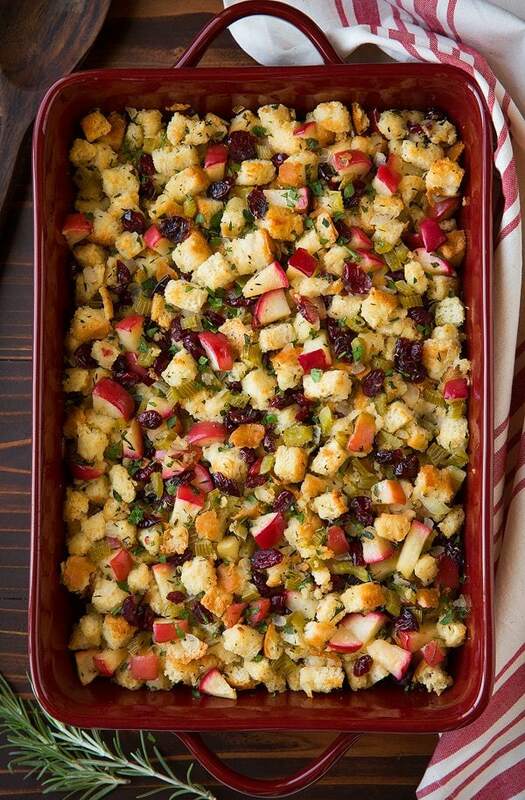 Off heat toss in cranberries and herbs. Toss bread cubes with apple mixture and chicken broth. Pour into a baking dish and bake through. With this recipe I highly recommend drying your own bread vs. buying the store-bought dried bread cubes. You can dry your bread a few days in advance (or even weeks if you just want to freeze the dried bread cubes, I always do that with fresh croutons). So really there’s no need to use the store-bought for Thanksgiving. Just be sure to use bread that has some structure to it, not the kind that squashes down to paper-thinness when you barely touch it. Also be sure to saute your veggies until they are softened because they won’t soften much more in the oven and no one wants to bite into crispy pieces of celery and onion in their stuffing. 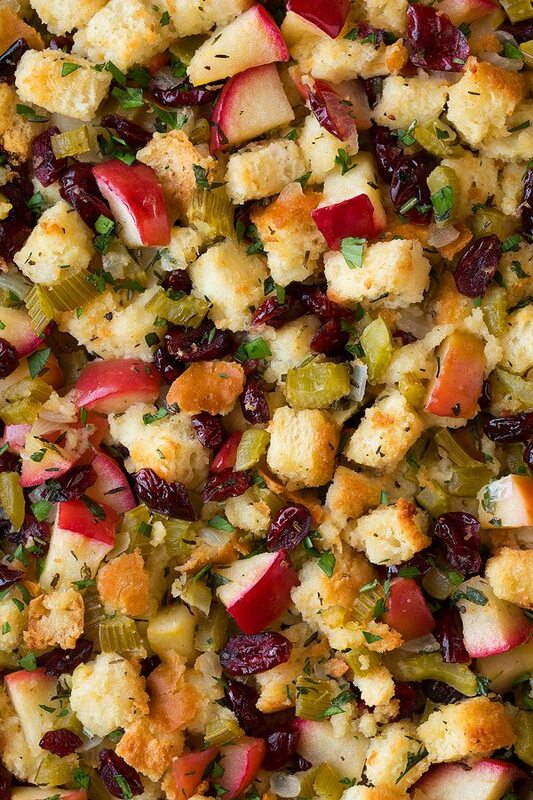 A festive colorful stuffing recipe filled with fresh apples, sweet dried cranberries and flavorful herbs. Perfect for the holidays or a fall dinner! Preheat oven to 300 degrees. Transfer bread cubes to two rimmed baking sheets and spread into an even layer. Place both sheets on two opposite oven racks (set near center) of preheated oven and allow to dry through, tossing bread cubes and rotating baking sheets to opposite racks once halfway through baking, about 30 minutes total. Remove from oven and set aside. Increase oven temperature to 325 degrees. Melt butter in a large skillet over medium heat. Add celery and onion, season lightly with salt and saute until softened, about 10 - 13 minutes. Add in apples and saute until they begin to break down and soften slightly, about 3 - 4 minutes. 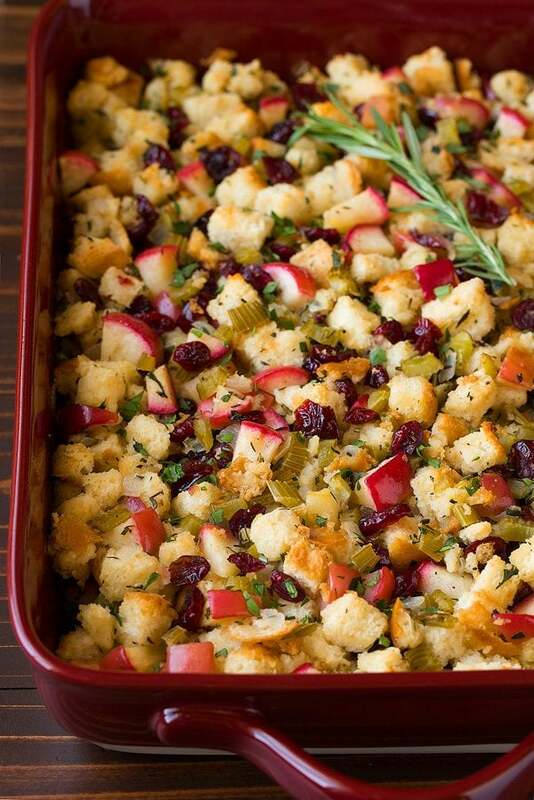 Remove from heat, toss in cranberries, 3 Tbsp parsley, rosemary, thyme and sage. Pour dried bread cubes in an extra large mixing bowl. 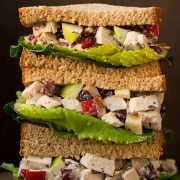 Pour apple mixture over bread cubes, season lightly with salt to taste then evenly pour in 1 cup of the chicken broth and gently toss mixture. Slowly pour in more broth as needed (and gently toss) until bread has nearly soaked entirely through**. Spray a 13 by 8-inch baking dish with non-stick cooking spray. Pour bread mixture into baking dish and gently spread into an even layer. Cover baking dish with foil and bake in preheated oven 15 minutes then uncover and bake until warmed through and top is golden brown, about 15 - 25 minutes longer. Serve warm sprinkled with remaining 1 Tbsp parsley. *I recommend using a brand such as Great Grains, Granny Sycamore or Granny's Delight. Don't use that super airy sandwich bread. It is too delicate and won't absorb much liquid. If you don't have the time to dry your own you can use 8 cups of the store-bought unseasoned bread cubes - the freshly dried are better though and you can dry them a few days before you need to use them (or even weeks and freeze them). I used the full 2 cups broth but only add as much as it takes to moisten the bread, all brands are a little different. You can also add a little more if you need more but don't overdue it. Lisa: I see that you also have a recipe for slow cooker stuffing on your website. Is there anyway this recipe could be adapted to make in the slow cooker? If so, what changes (if any) would I need to make? 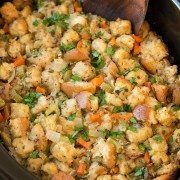 Paige Flamm: This stuffing looks delicious! I need to make this in a couple weeks!